Agilent Technologies has introduced a modular solar array simulator that offers high power (up to 1200W) in small package (2U high). Designed for customers testing a satellite's power system, the Agilent E4360 solar array simulator allows R&D engineers, manufacturing engineers and system integrators to accurately simulate the I-V curve of a solar panel's array under various environmental conditions. In addition to the new standalone instrument, Agilent now provides an affordable, full turn-key solar array simulator system. "Solar array simulator DC power supplies are core components of a satellite test system," said Gary Whitman, Vice President of Agilent Technologies’ System Products Division. "As satellites get bigger and demand more power from their solar panels, there is a need for higher-power devices to simulate those higher-power solar panels. The E4360 satisfies this need by providing an affordable, high power, compact test solution." 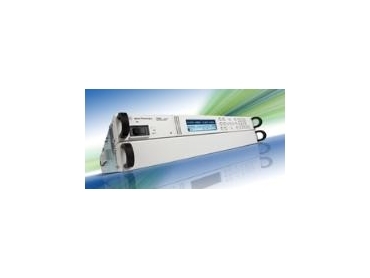 The Agilent E4360 is a dual output programmable DC power source that provides up to two outputs at up to 600W per output. The Agilent E4360 can accurately simulate the I-V curve of all types of solar arrays under varying environmental conditions such as eclipse, spin, rotation, age and temperature. This is an ideal solar array simulator to provide universal serial bus (USB 2.0), 10/100 Base-T Ethernet (LAN) and general-purpose interface bus (GPIB) interfaces as standard equipment, enabling easy, low-cost connectivity to a PC. The E4360 can also be remotely operated and monitored from any Web browser through a built-in Web server and graphical user interface. The Agilent modular solar array simulator offers many system-ready features to simplify the programming and control of the instrument. The system software driver allows a single function call to set up and control multiple E4360s in a system. Multiple solar array simulators can be configured without writing a single line of code. Furthermore, a new capability simplifies parallel operation such that two outputs act as a single synchronised channel of twice the output current and power without having to write software to manage their interaction. Agilent Technologies' affordable, full turn-key solar array simulator system is built on the Agilent E4360 modular solar array simulator platform. The modular architecture makes it easy to configure, re-configure and support this system since modules can be easily moved and replaced. The system's components include commercial-off-the-shelf instruments (COTS), a standard PC and standard interconnectivity (LAN, USB) for low-cost, easy support and reduced downtime. Agilent Technologies can design and customise this turn-key system to meet specific customer requirements including instruments, cabling and application-specific software.